A crash, a technical failure and tricky weather conditions couldn’t stop impressive British rider Chaz Davies from beating home favourite Chris Vermeulen and Colin Edwards on the opening day of action in Phillip Island. Chaz Davies finished today with the 13th best overall time on only his third appearance on board the D’Antin Ducati GP7. His best lap of 1.33.910 saw him edge out factory Suzuki rider Chris Vermeulen by 0.020s and double World Superbike champion Colin Edwards by 0.026sec at end of an eventful afternoon session. He missed the first quarter of the second session when an electronic sensor failed just as he was about to leave his pitbox, and his hopes of getting in crucial dry track time were ruined by intermittent rain interruptions. He also walked away unhurt from a crash in the final three minutes of the session at the Honda hairpin, which came just seconds before new world champion Casey Stoner tumbled off in exactly the same circumstances at the same corner. Chaz Davies, who has fully recovered from the serious left elbow infection which robbed him of the chance to join the D’Antin Ducati squad in Japan, told MCN: “It wasn’t too bad but it was a bit of a mixed day. “We had a sensor fail and not too sure what happened but the bike stopped as soon as we’d started it. It broke when it started up. Chaz Davies said he was reasonably happy with his lap time but admitted more had to come from him rather than the motorcycle tomorrow. He said: “The conditions were less than favourable today and I was just trying to get a feeling with the bike. This afternoon we made a couple of little changes to help with the dry but then it was just about trying to find a rhythm around here. “Even though I’ve been here four times before it’s the first time for me on a MotoGP bike. You’ve got to change lines and change everything that I know about riding around here. “I need to stop the front diving quite as much and stop it pushing on the bumps throughout the fast corners. But most time will come from me. 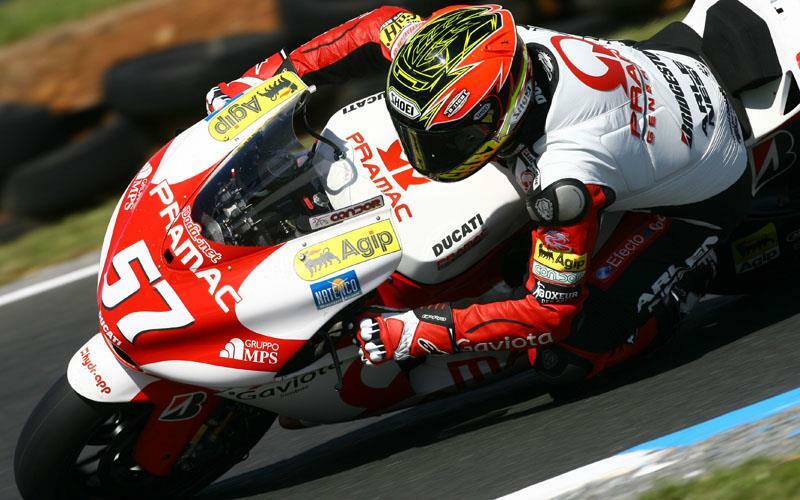 Chaz Davies said his biggest problem was getting the GP7 to handle smoothly over some of the bumpy sections at Phillip Island. He also got his first chance to ride a MotoGP bike in the wet today as Phillip Island was struck by typically unpredictable weather. “If we can get the bike settled down a bit more and less aggressive then I think it will bode well for me. We need to get the chassis set-up because it is a handful. “When it hits a bump the chassis gets a little bit upset on the rear. If it hits a bump hard on the rear it upsets the front a bit too much. “From the second to last corner to the last corner the front is a bit upset all through there. It’s difficult to keep on top of. It was pretty difficult in the rain too. “I had a few moments out there. I could definitely feel the traction control working but there were a couple of times where it was pretty close. Gusting winds also added to the challenge facing Chaz Davies, with the D’Antin squad not having the new smaller fairing available that was used by Stoner today. Designed to work in blustery conditions, Chaz Davies said the wind was tough to get used to. He said: “It’s not so much that you get buffeted around because it has got the weight to keep it in line, but turning and making the bike cut through the wind is a little bit tricky.